When you see a soccer mom stepping out of one of today’s Jeep SUVs, unloading a pile of kids, groceries and athletic equipment in today’s modern world you would never guess that the versatile and luxurious vehicles not so humble beginnings evolved from a request from the department of defense prior to WWII over 75 years ago. The military was looking to replace the motorcycle and other vehicles in 1939. They reached out to 135 car companies to compete for the right to build the next great military vehicle. One of the three companies that decided to fulfill the militaries need was Bantam. They brought in a man named Karl Probst to help in the design and production. In 1940 together they had produced the first prototype to meet the military specs called the “Bantam Blitzbuggy”. The military had certain requirements for the new do it all vehicle, one of which was the vehicle had to be 4×4 (four wheel drive). Considered by many as the vehicle that won the war, it wasn’t long before the popular new vehicle was in demand just as much in main street as on the allied fronts in Europe and the Pacific. In 1945 the CJ series, named as an abbreviation for “Civilian Jeep” was introduced to the American market and the popularity of this unique and versatile vehicle has never looked back since. The evolution of the Jeep throughout the years has taken it from a tough warrior in the war and all military activities abroad that have followed since, to a surfers dream vehicle cruising down the beach into today’s modern needs of busy and active families that want toughness, luxury and versatility all in one vehicle. 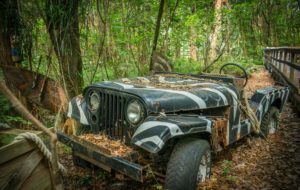 The popular Jeep C J series has progressed and kept up with the times through all the decades in the second half of the 20th century and is still a popular choice for consumers and militaries throughout the world in the first two decades of the 21st century. The Jeep C J series began to evolve with the upgraded design in the 50’s and deep into the 80’s when the now still popular Wrangler was introduced in 1987. Today they offer 11 models to consumers and still showing why it always has been and always will be the leader in versatility and durability. Interested in Selling or Buying a Vintage Jeep? Part of the reason Classic Cars Online US exists is to help connect classic car buyers and sellers, and we’ve added several ways for you to connect – pick your favorite, or join us in all four places: (1) sign up for the newsletter on the upper right side of this page, or 2) visit the Classifieds page here on the site, (3) visit and like this site’s Facebook page, (4) the Best Classic Cars for Sale Online page or (5) join the Classic Cars Online: Classic Cars for Sale group if you are looking to buy or sell classic cars such as the classic Jeep.